Congratulations to Emily in Spartanburg, South Carolina for winning last week's New Release Spotlight giveaway! Emily chose Jack Montgomery: World War II: Gallantry at Anzio as her winning book. The New Release giveaway continues this week--just scroll to the bottom of this post to enter. This week is a little slow, with only 11 books on the list. 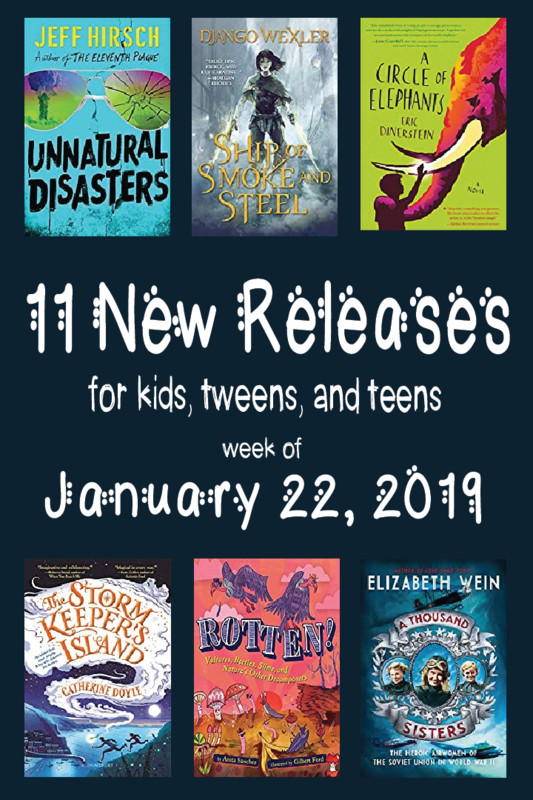 I am excited to order Ship of Smoke and Steel and The Storm Keeper's Island for the library, and as I'm a huge fan of Katie McGarry, I'm sure I'll read Only a Breath Apart at some point. Jesse dreams of working the land that's been in his family forever. But he's cursed to lose everything he loves most. Scarlett is desperate to escape her "charmed" life. But leaving a small town is easier said than done. Despite their history of heartbreak, when Jesse sees a way they can work together to each get what they want, Scarlett can't say no. Each midnight meeting between Jesse and Scarlett will push them to confront their secrets and their feelings for each other. Seventeen-year-old Lacey Burke responds to the failure of her school's abstinence-only sexual education curriculum by handing out advice and contraceptives in the girls' bathroom, even as her own life gets complicated. In the early years of World War II, Josef Stalin issued an order that made the Soviet Union the first country in the world to allow female pilots to fly in combat. Led by Marina Raskova, these three regiments, including the 588th Night Bomber Regiment, nicknamed the "night witches," faced intense pressure and obstacles both in the sky and on the ground. Some of these young women perished in flames. Many of them were in their teens when they went to war. This is the story of Raskova's three regiments, women who enlisted and were deployed on the front lines of battle as navigators, pilots, and mechanics. Warsaw, Poland. The year is 1940 and Lillia is fifteen when her mother, Alenka, disappears and her father flees with Lillia and her younger sister, Naomi, to Shanghai, one of the few places that will accept Jews without visas. There they struggle to make a life; they have no money, there is little work, no decent place to live, a culture that doesn't understand them. Meanwhile Lillia is growing up, trying to care for Naomi, whose development is frighteningly slow, in part from malnourishment. And always the worry about Alenka. How will she find them? Is she still alive? Lucy Weaver has her future all figured out. Make an appearance at prom, ditch graduation, and then head out on an epic road trip with her boyfriend, Luke. But when everyone's phones start to ring halfway through the dance, Lucy knows something terrible has happened--something big. Decades of climate change have left the world teetering on the brink--entire cities drowned, violent extremism on the rise, millions of refugees with nowhere to turn. Is this the night it finally slips over the edge? In the lower wards of Kahnzoka, the great port city of the Blessed Empire, eighteen-year-old ward boss Isoka enforces the will of her criminal masters with the power of Melos, the Well of Combat. The money she collects goes to keep her little sister living in comfort, far from the bloody streets they grew up on. When Isoka's magic is discovered by the government, she's arrested and brought to the Emperor's spymaster, who sends her on an impossible mission: steal Soliton, a legendary ghost ship--a ship from which no one has ever returned. If she fails, her sister's life is forfeit. In the mid- to late-nineteenth century, a burgeoning science called electricity promised to shine new light on a rousing nation. Inventive and ambitious minds were hard at work. Soon that spark was fanned, and a fiery war was under way to be the first to light--and run--the world with electricity. Thomas Alva Edison, the inventor of direct current (DC), engaged in a brutal battle with Nikola Tesla and George Westinghouse, the inventors of alternating current (AC). There would be no ties in this race--only a winner and a loser. Milla knows two things to be true: Demons are real, and fear will keep her safe. Milla's whole world is her family's farm. She is never allowed to travel to the village and her only friend is her beloved older brother, Niklas. When a bright-eyed girl named Iris comes to stay, Milla hopes her loneliness might finally be coming to an end. But Iris has a secret she's forbidden to share: The village is cursed by a demon who possesses girls at random, and the townspeople live in terror of who it will come for next. Now, it seems, the demon has come for Iris. When Iris is captured and imprisoned with other possessed girls, Milla leaves home to rescue her and break the curse forever. Companion to: What Elephants Know. Thirteen-year-old Nanda Singh, the youngest elephant driver in Nepal, enjoys a very special relationship with his tusker, Hira Prashad, through which he grows in understanding and compassion with all animals, including humans. Looking for a middle grade read-aloud for St. Patrick's Day? This one looks great! Fionn Boyle comes from a long line of brave seafarers, people with the ocean behind their eyes. But he can't help but fear the open sea. For years, Fionn's mother has told him stories of Arranmore Island, a strange place that seems to haunt her. Fionn has always wondered about this mysterious island, and from the day he arrives he starts noticing things that can't be explained. He can sense the island all around him, and it feels like the island is watching him, too. WHAT THE REVIEWS SAY: " A first purchase, modern yet timeless fantasy with plenty of heart and a Celtic twist" (SLJ, 1 Nov 2018). What's that terrible smell? It's the revolting scent of rot. But being rotten isn't necessarily bad. If nothing ever rotted, nothing new could live. Decomposition may seem like the last stop on the food chain, but it's just the beginning. When dead plants and animals decay, they give life to a host of other creatures, and each one helps ecosystems thrive. Decomposition happens in the forest, the ocean--even in your stomach and between your teeth! From vultures and sharks to bacteria, maggots, mushrooms, and more, discover the dirty rotten truth about one of nature's most fascinating processes. Loving the anthologies that are coming out! I really value your posts to keep me in the loop of what my students will LOVE! 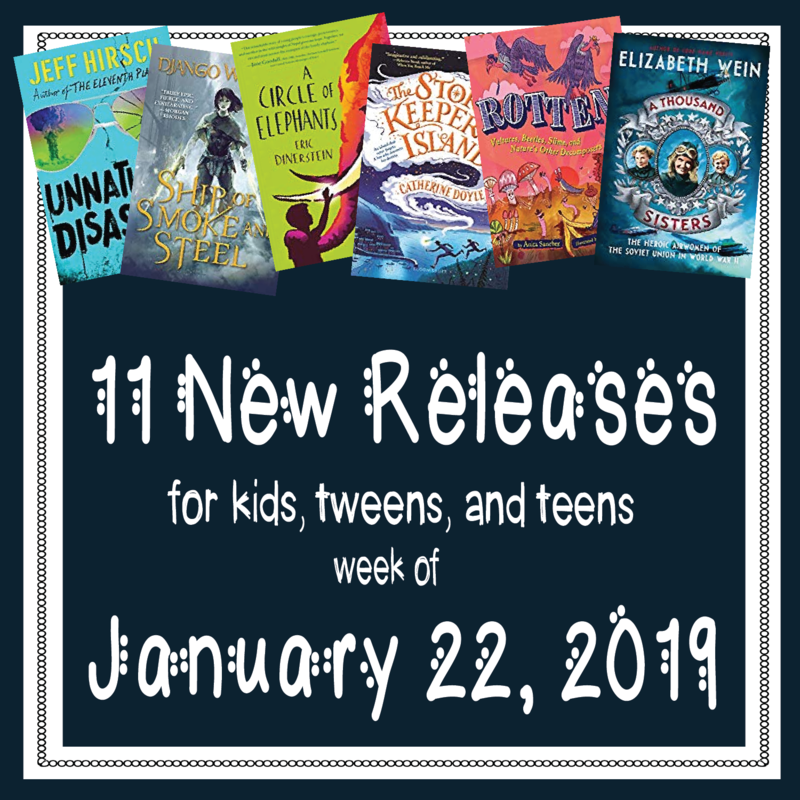 Some great new releases this week! I look forward to reading these posts every Tuesday! Thank you! Several new titles to add to my cart, thank you! I'm excited for the new Emma Mills book, Famous in a Small Town. Thanks for the great reviews and I appreciate you adding Readalikes! PLEASE keep up with the Readalikes! So helpful. I am an admin assistant and the librarian at our small school so I truly appreciate your guidance when wading through the deluge of book choices in the world. If you can manage it I would love to see your feedback on more non-fiction too! Glad you are enjoying them! No worries, I have no intention of stopping the New Release Spotlights. I've been doing them every Tuesday since May 2016, with only a couple of small gaps every now and then. I enjoy them and find them useful, too! The book titled, "Ship of Smoke and Steel" looks very interesting. Yes! I have my eye on this one, too. And The Storm Keeper's Island! Great List! Thanks for all your hard work! IT really helps me to order new and interesting books! I look forward to your updates each week. I almost always add titles to my list of books I need to purchase for the media center.